CK pointed me to this post on Wizbang from a self-described "southern stay-at-home mom with a hick accent and a limited vocabulary." 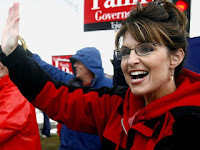 It's all about why she and people like her still L-O-V-E Sarah Palin. Even after Tina Fey. It's worth reading if you fear you suffer from NASCAR Blindness, especially the comments, to get a sense of what the other side is thinking and to realize that they are not all knuckle draggers and mouth breathers.